As a Toronto wedding photographer, I have to find indoors locations whenever the weather does not collaborate, like it happened at this Toronto Botanical Garden wedding. During a workshop with Yervant, one of the best wedding photographers in the world, I learned how to take advantage of artworks when photographing indoors. That proved handy at this particular wedding when, during the golden hour, it started raining cats and dogs so I had to photograph indoors. Fortunately, one of the bridal suites included a few photographs that I used to add an element of interest into the photo. Although this is a directed photograph, I want to give it a candid feel. As such, I asked the bride and groom to behave as if there was nobody watching them. They embraced each other and the groom kissed her neck softly. It was at this moment when I asked the bride close her eyes, raise her chin and breathe through her mouth. That gives this image romantic look and also a voyeuristic feel. 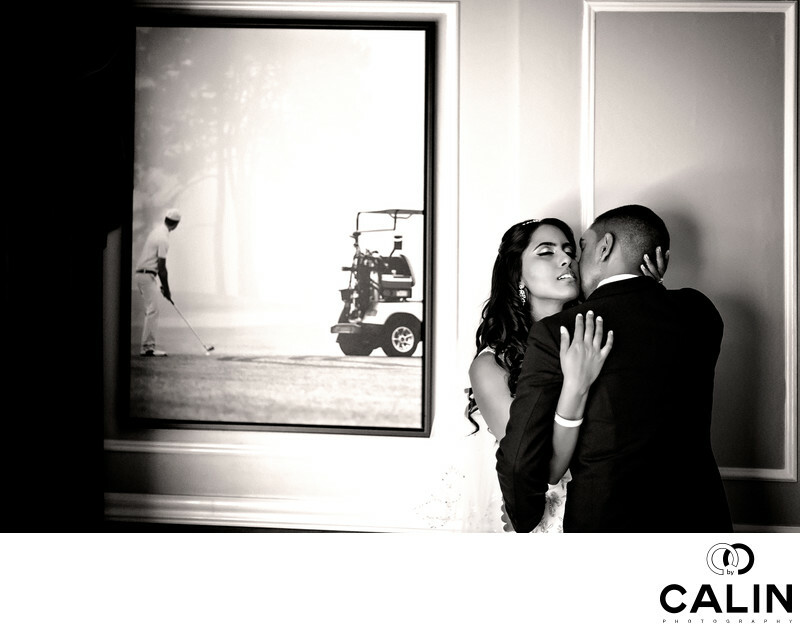 From composition standpoint, this is an asymmetrical image with the bride and groom placed on the right-hand side of the frame. Still, they are perfectly balanced visually by the photograph on the left. Because I wanted to keep the candid feel of this shot, I choose a black and white processing.